While describing Rajasthan, the word ‘colorful’ is probably the most appropriate adjective. The word applies both literally and figuratively, as the desert terrain is alive with colors and one wonders how humans have outdone the contribution of nature in making Rajasthan so colorful. Be it men or women, the dressing pattern and choice of colors outshine even the color of the rainbow. Men, with their upturned mustaches, sport attractive turbans in orange, pink, yellow and red and animals here are adorned with colorful ornaments, their faces being painted in complex patterns and designs. This amazing pattern of colors is seen in the beautiful and magnificent forts and palaces as well. As you traverse across the sandy desert, you get to feel the warmth and beauty of the land, which has thousands of bards of bravery to tell. The magnificent forts and palaces stand as a testimony to the bygone era and speak volumes of the opulence of the rulers. One is surprised how the human spirit fought against all odds to erect such enormous structures in this barren land. Every piece of monument has a story of heroism, chivalry and romance attached to it. As you move from one place to another, you get to explore and discover new facets of the desert state. The magnificent structures leave you awestruck while the simplicity and the way of life of the common folks makes an everlasting impression on your mind. Rajasthan is truly unbelievable! The culturally rich state of Rajasthan stands as a witness to its bygone era. Abounding in the tales of heroism, chivalry and romance, Rajasthan is unlike any other state. It is also the birthplace of the brave and chivalrous Rajputs. The architecturally fascinating Rajasthan weaves magic on its visitors. Rajasthan has no parallel in the world as far as its heritage and culture are concerned. Rajasthan offers you a wide variety ranging from sand dunes to lush green forests to the rich wildlife. Moving across Rajasthan, you will find the Aravali Mountains providing an interesting background to the otherwise barren topography. It was in these hills that the Rajput hero, Rana Pratap kept marshalling his resources to take on the mighty Mughals. Numerous structures that you come across in these parts of Rajasthan are proof of the spirit of the erstwhile rulers of Rajasthan. As you start to dig more deeply into the history of the land, you come across many brave women of which Padmini’s story is more interesting, who gave up her life to save her honor. Right from forts and palaces to museums to wildlife sanctuaries, each and every city of Rajasthan offers something to you. The colorful fairs and festivals of the state add more vigor to the already colorful landscape. If you are traveling to Rajasthan during fairs and festivals, you can get a real hand experience of the earthy charm that the land is so well known for. You will get a real hand experience of the desert state as we explore one place after another. 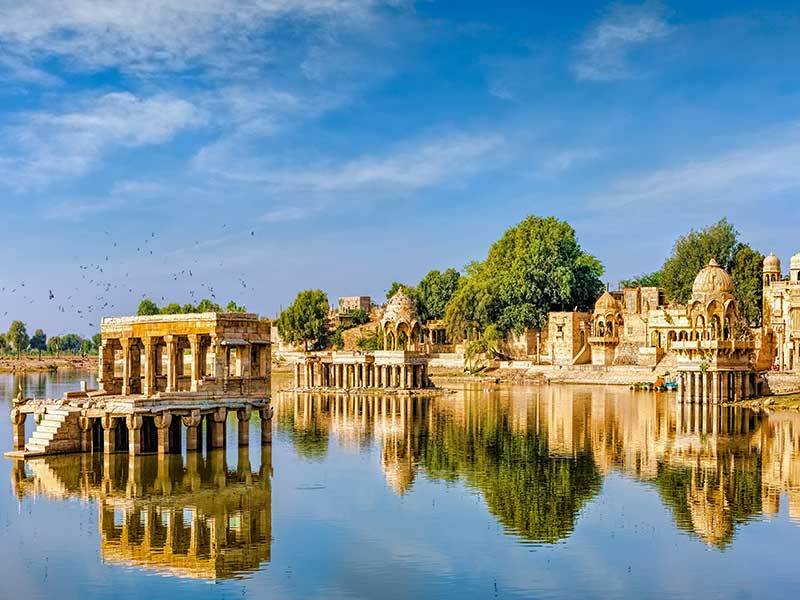 Be it the feeling of royalty while ascending the Amber fort or the mystique charm of Pushkar, we plan to unravel every bit of Rajasthan for you!